The world's leading hot stone cooking company, for the perfect dining experience. 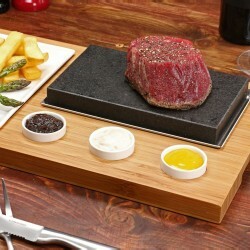 SteakStones hot stone cooking products are used in top restaurants all over the world, allowing diners to enjoy a sensational meal experience. Their stylish range of high quality cooking products and accessories are also fantastic for use at home, providing you with a memorable experience but also a fresh and healthy way of cooking your food. Hot stone cooking is perfect for deeper cuts of steak, meat and fish to ensure that every bite is cooked exactly as you like. There really is no better, healthier or more fun way to cook.